Today is Labor Day and I am sorely tempted to observe the day by taking a break from the “work” of writing a blog post for publication on this particular Monday morning. 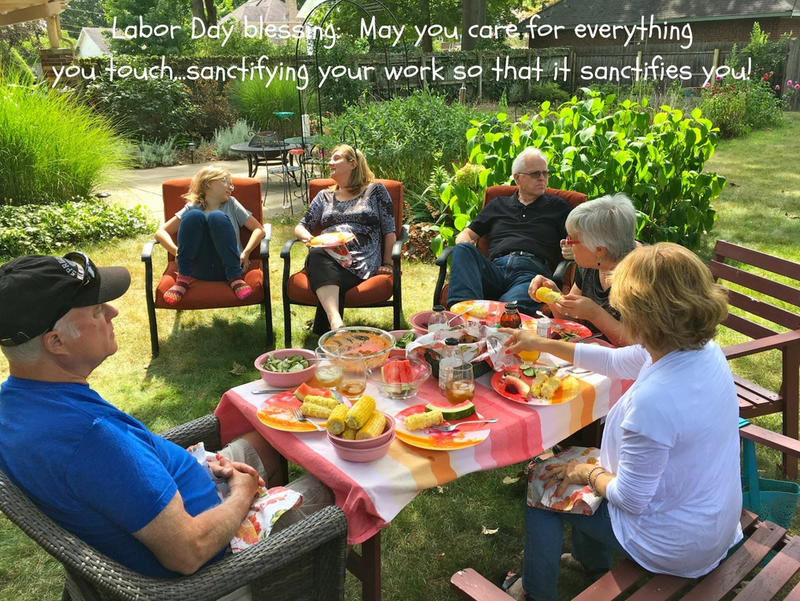 Pastor Janice provided plenty of fodder, however, for today’s Labor Day post by inviting Eunice, Loren, Julie, and Gail to share during worship a bit about how they see their work as an opportunity for service. Eunice spoke of offering care to nursing home residents and asked us to imagine how it might feel to be living in a facility with people we don’t know, fed and clothed by strangers. Loren and Julie told of their work with CommunityWide Federal Credit Union, which became more than volunteer work for Loren when he developed sight issues some 45 years ago. The organization assisted many who had no family or church support, Loren said, adding that the credit union’s mission was “to serve members’ best interests in a variety of ways.” Julie noted that a reward of the job for her has been an awareness of representing the face of God to the credit union’s clientele. Gail, a recently retired long-time academic advisor and counselor at Ivy Tech Community College, said her work typically involved walking with young people who were first generation college students. “Those we serve end up being blessings,” she said, telling the story of a student who offered gratitude for long-ago assistance on the final day of Gail’s work as an academic advisor. “Serving and blessing are reciprocal,” she concluded. Paul and Ruth from our own congregation have made seven trips to Mennonite Disaster Service (MDS) sites like present-day Houston to assist in cleanup and recovery work following a major storm. Their work typically involved food preparation for other volunteers. Houston opportunities for volunteer work will most certainly be coming our way soon. You can stay abreast of volunteer options in Houston by checking MDS’ Facebook page.